Cream cheese is a famous ingredient in countless recipes. In stores, however, we often see a similarly packaged cheese labeled “Neufchatel” in the same section. You may have read in articles that both are interchangeable in cooking, but are they really? 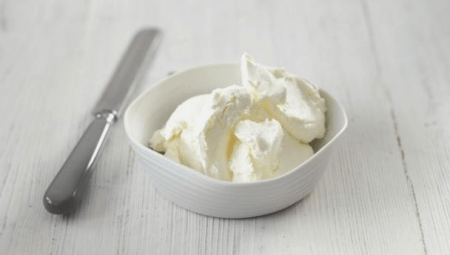 This article will focus on the difference between cream cheese and Neufchatel cheese. Cream cheese is a type of cheese that is white and soft enough to be used as a spread at normal temperatures. Although it is typically made from a combination of cream and pasteurized milk, some manufacturers may add stabilizing components to it like carrageenan and gum. Some homemade versions of cream cheese may include additional ingredients like salt and vinegar. Both homemade and commercial versions do not naturally mature; thus, cream cheese has to be consumed fresh and it has a short shelf life. It is normally sold in bars wrapped in foil. This mild-tasting cheese is very versatile in the kitchen. Although it is famous as one of the main ingredients in cheesecake recipes, it is used as an ingredient for dips and toppings as well. Additionally, many people use cream cheese as a component to make sauces thick and creamy and to make cake frosting. However, it is important to note that it contains approximately 33% milk fat, so it has to be consumed in moderation. Although it is unclear as to where cream cheese originated, it has been widely used in England since the 1500s. On the other hand, Neufchatel cheese originally came from Neufchatel-en-Bray, a French commune in the Normandy region in the sixth century. The real French Neufchatel is made from raw cow’s milk. It is encased in a dry but edible rind and with a soft, white, spreadable and grainy center. This type of cheese naturally matures in 6-10 weeks. Its moderate flavor becomes saltier and more intense and its texture becomes dry and firm as it ripens. Commercially sold Neufchatel cheese comes in heart shapes, but is also sold in shapes like logs and bars. In the 1870s, an American version of the French Neufchatel was born. A dairyman based in New York named William Lawrence added cream to Neufchatel, creating a softer cheese. This new creation was dubbed “American Neufchatel,” sometimes labeled “Farmer’s Cheese.” The foil-wrapped Neufchatel cheese sold in the market these days is not the real French Neufchatel but is the modified or American version made with pasteurized cow’s milk. Therefore, when people say “Neufchatel,” they are actually referring to the American version. American Neufchatel is mild and the texture is softer. It has a significantly lower fat and calorie content which is why it is a healthier option in some recipes. Because of its softness, American Neufchatel cheese is also famously used for dips, bread spread and even sauces. What, then, is the difference between cream cheese and Neufchatel? When it comes to texture and taste, American Neufchatel is milder and softer than cream cheese. Although it can be an alternative to cream cheese in some recipes, American Neufchatel may not be a a great a alternative in cheesecake recipes because of its softness. Moreover, both American Neufchatel and cream cheese are made from pasteurized milk, but the former has a lower fat and calorie content, making it a better option in some recipes. 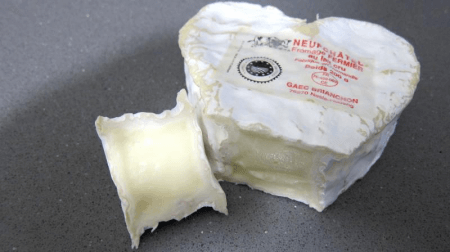 The real Neufchatel is made from raw cow’s milk and has an intense flavor. Further, Neufchatel originally came from France in the sixth century, while the use of cream cheese started in England in the 1500s. Nowadays, the term “Neufchatel” refers to the modified or American Neufchatel which is very similar to cream cheese. Both American Neufchatel and cream cheese come in bars wrapped in foil, although the real Neufchatel is heart shaped and encased in a dry rind.